More contemporary table lamps all now available to buy at Harvest Moon to light up your home, hotel or restaurant. In the contemporary table lamps range below we've got a fabulous triple antler table lamp, several contemporary white, blue and grey wash and weathered wooden table lamps and other contemporary wooden table lamps, chrome table lamps, a silver branch table lamp, a selection of contemporary glass table lamps, silver and gold coloured table lamps in different designs and various contemporary metal and metal / glass urn table lamps. The range also includes a retro "Coral Reef" table lamp, nickel table lamps including a large nickel finish urn table lamp with black shade as can be seen in the image above, contemporary tripod table lamps, VERY modern perspex animation table lamps and more! 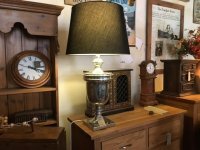 All the contemporary table lamps shown below include a shade and can be used as living room table lamps, dining room lighting, bedroom lighting, study lighting or any other room you fancy! 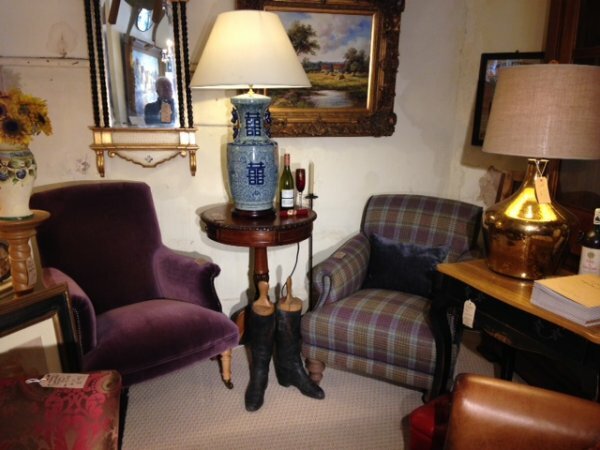 FREE 7-14 days delivery to UK mainland addresses on all table lamp and other lighting orders at Harvest Moon. Like the table lamp? Click here for antler chandeliers.. The image below shows the contemporary large nickel finish table lamp with black shade on display in our Southport furniture showrooms. Lots more tripod lighting available in our floor standing lamps section! 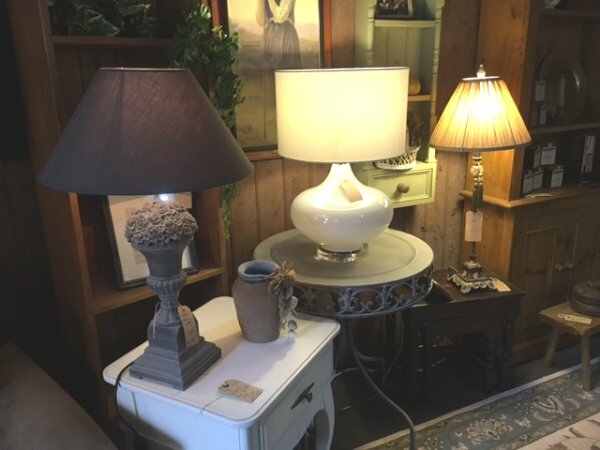 The image below shows the contemporary silvered brown table lamp with linen shade along with a classic table lamp and 2 Tetrad chairs on display in our Southport furniture showrooms. The next image also shows the contemporary silvered brown table lamp with linen shade in our Southport furniture showrooms. The image below shows the contemporary round white table lamp with white shade in the middle plus 2 classic table lamps on display in our Southport furniture showroom.